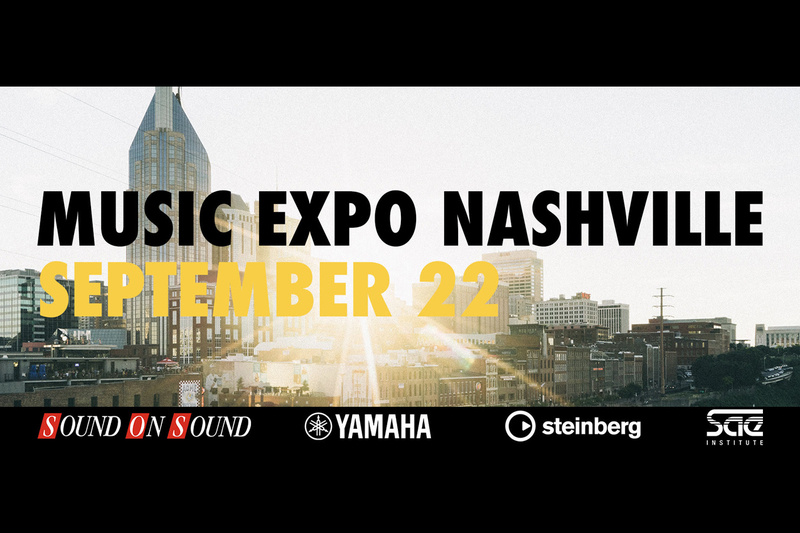 Music Expo, the multi-city conference series for music makers in partnership with Sound On Sound, has announced the initial panelists, program highlights and exhibitors for its first-ever Nashville conference. Hosted by SAE Institute, the full day of educational sessions with music production masterclasses, music business discussions and the latest in music technology will take place on Saturday, Sept. 22, 2018. Early bird tickets are $25 and are available at eventbrite.com. Music Expo Nashville’s programming will include a combination of keynote presentations, live demos, panels and educational workshops with tracks covering business, technology and creative. “The Singers Ultimate Challenge: Developing Your Vocal Identity” – Producer and Owner of Decapo Music, Jonell Polansky will share tips on how to demystify the vocal recording session. Working with artists to develop their “vocal identity” is Polansky’s specialty, and she will discuss how to empower a great vocal performance in the studio, develop a ‘vocal vocabulary,’ and work with a variety of personalities. “The Changing Business & Craft of Nashville Songwriting” Presented by Song Assembly – Grammy award-winning songwriter Steve Leslie will lead a panel to discuss hot button issues; writing with the artist, publishers as A&R, track guys and union demos, how technology affects the craft and country radio singles and the album cut. The panel will consist of professional songwriters from the glory days of the 1990’s and the new young guns. “Making The Most With Minimal Gear” – Producer/Engineer Hayley McLean will demonstrate, with a live track, how to build a professional sounding recording with limited resources and edit with a basic interface, Wave plugins and basic software synths. Her trial and error process of creative software manipulation is a skill she’s put to work on many projects with award-winning Producers and Engineers. “Breaking Into The Music Business and Staying There” – MusicRow Magazine’s Sherod Robertson will moderate a Q&A with Grammy Award-winning Recording Engineer Zach Allen to discuss how to prepare for a recording session, how to speed up workflow in the studio, the Do’s and Don’ts in the recording studio, and how to use technical problems as opportunities. “Making Your Mix Standout” – Award-winning Producer/Engineer and Songwriter Robert Venable (Kelly Clarkson, Twenty One Pilots, Megadeth) will discuss his proven techniques to take a mix to the next level and make it stand out, applicable to any independent artist. “The Craft of Writing a Country Song: How To Tell a Story with Words & Music” Presented by Song Assembly – Songwriter Steve Leslie will discuss how to develop a story-song that connects with listeners and provide an overview of the principles covered in his online songwriting course at www.songassembly.co. As a hitmaker in Nashville for 25+ years, will share tips on storytelling from his perspective, working and living in Music City – a place that’s famous for songwriting. “Brand Your Band to Get More Fans” – Brian Bauer (Bauer Entertainment Marketing) will moderate the discussion with brand experts Logan Crowell (Record Realization/HOME), artist/producer/label owner Vian Izak (Vohnic Music LLC), and alt-Rock duo Ariel Bloomer and Shawn Jump (Icon for Hire).